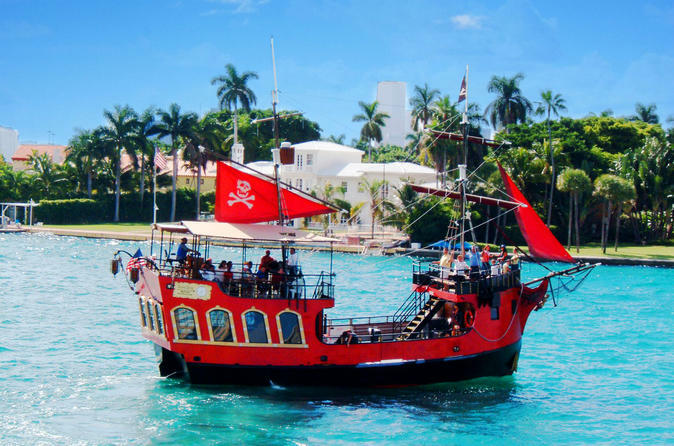 Let your imagination soar while sailing on Biscayne Bay aboard Miami’s only pirate ship. Admire the downtown Miami skyline, Venetian Islands, and opulent mansions from these coastal waters. During this action-packed, 80-minute sightseeing tour, costumed pirates entertain you with their swashbuckling antics while sea shanties set the mood. Your pirate ship sets sail from the centrally located Bayside Marketplace in Miami. You're welcomed aboard by a crew of salty pirates as your fellow shipmates for the 80-minute journey around Biscayne Bay, a lagoon discovered by Spanish conquistador Ponce de Leon. While you coast along, check out the views of the Miami skyline, the Port of Miami, Fisher Island, Star Island, and the Venetian Islands. Your guide narrates the sights and points out notable landmarks, including mansions of local celebrities. Pirate music and swashbuckling entertainers create an exciting atmosphere for adults and children alike. Cocktails, beer, soft drinks, and snacks are available for purchase at the bar on board. Kids can even search for a hidden treasure within the ship.